Isfahan: The fourth day of the farmers’ demonstration in Isfahan was held today with the widespread presence of men and women today. A mother in the demonstration shouted at the demonstration of lack of water for agriculture: no water will flow into the river. We are not at home. Kerman: South Roodbar farmers in Kerman province blocked the roads in a protest action due to low tomato prices and lack of government support. They said that our problem is that we do not cut our products or government or buy at very low prices, and we just lose. Bandar Abbas: Workers from Bandar Abbas Municipality Contracting Officer gathered in the city in protest of non-payment of their salary rights several months ago and demanded their salaries. Ghazvin: Iran’s powder metallurgy workers in Qazvin have been demanding their rights by holding a protest rally against the governorate of Qazvin. They wrote the manuscripts written on them: “The empty table of metallurgical powder workers, the year of 1997, was fired, unemployment, and no money. 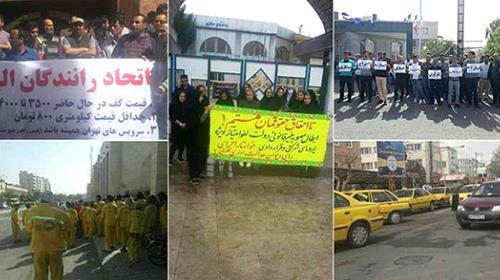 Karaj: Shaped drivers in the Azimyeh city of Karaj held a protest rally due to low fares. Uromieh: Taxi drivers gathered in front of the governorate of Orumieh in protest of their income decline in Revolution Square and stopped working. Ahvaz: A group of looters of the Arman Vahdat Institute, in Ahvaz, gathered and protested against the building of the Institute of the United Nations and entered the building. The looted slogans chanted: “So that our money was flooded every day, just the same year, we ran, we just heard lies, the balloon tank of the peoples of the world should close, the bankrupt nations sat on our money, the government was blind and blind, and did not see the robbery, the hands What did you do with our money? Kohgiluyeh and Boyer Ahmad: A group of applicants for employment in various disciplines related to the medical sciences exam in protest against how they would qualify for contract and corporate forces in front of the Kohgiluyeh and Boyerahmad Governorate.